NATIVE AMERICAN TRIBES OF WISCONSIN ELEMENTARY. CURRICULUM. Native Americans didn’t coin the term “eat local". For them, eating local was simply a way of life as they hunted, fished, and gathered plants to provide their food source. Long before white settlers began farming the land, the Winnebago (now known as Ho-Chunk) lived in Wisconsin as a successful agricultural tribe. 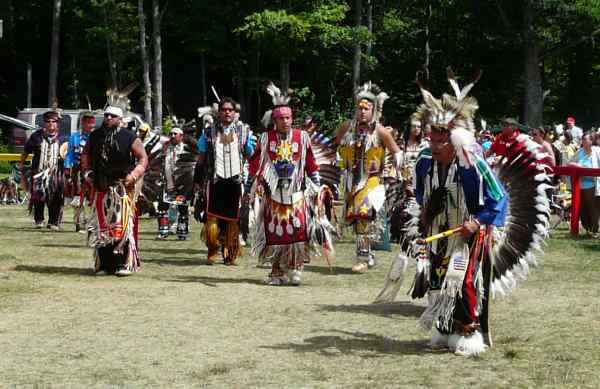 The pow-wow at Lac Vieux Desert Watersmeet came to a close Sunday after three exciting days of pow wow. The event seemed in jeopardy Friday evening when a severe storm raged through the area. Tents were blown down by the stronf winds and regalia damaged by the heavy rains. One tent blown over caught fire and was destroyed. Unfortunately, the weather sent some Pow-Wow participants home. Powwows have special meaning for Native Americans, from the beat of the drum to the dancers’ dress. All will be on display this weekend at the annual Mending the Sacred Hoop powwow this Saturday and Sunday at Cal Zorn Park in Tecumseh. This is the eighth year for the powwow, which is sponsored by the Leh Nah Weh Native American organization and the city of Tecumseh. 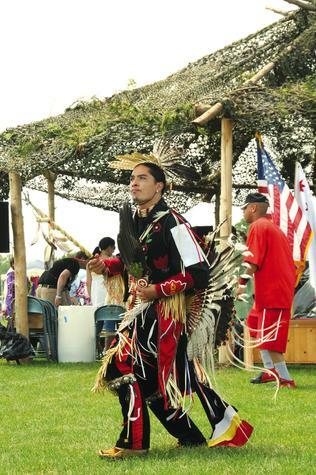 The Mending the Sacred Hoop Pow Wow is Saturday and Sunday at Cal Zorn Park in Tecumseh at the corner of West Russell Road and Raisin Center Highway. Time: Gates open both days at 10 a.m. Admission: $5 for adults, $3 for students and $2 for seniors. A weekend pass is $8, and a $10 one-day family pass is available. 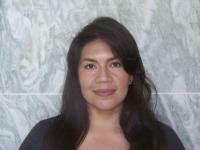 U.S. President Barack Obama announced Monday he has selected Kimberly Teehee to be his senior policy adviser for Native American affairs. "Kim Teehee will be a tremendous asset to our team as we work to strengthen and build on the nation-to-nation relationship between the United States and tribal nations," Obama said in a statement released by the White House. "She is rightly recognized as an outstanding advocate for Indian country, and she will provide a direct interface at the highest level of my administration, assuring a voice for Native Americans during policy-making decisions." Teehee, a member of the Cherokee Nation, will advise Obama on issues affecting Indian tribes, the statement said. Since January 1998, Teehee has been a senior adviser to Rep. Dale Kildee, D-Mich, who is co-chairman of the House of Representatives Native American Caucus She also served as director of Native American Outreach for the Presidential Inaugural Committee for Bill Clinton's second Inauguration. She was deputy director of Native American Outreach at the Democratic National Committee and held various positions with the Cherokee Nation of Oklahoma. An opening reception for the artist took place at gallery Thursday, January 22nd. As the son of a Finnish mother and an Ojibwe father, Carl Gawboy's paintings convey a unique vantage point. Raised on his mother's family farm in northern Minnesota, the youngest of eight children, Gawboy decided early to become an artist. He was determined that his art would not be falsely romantic, but would rather draw on his unique childhood experiences to tell the story of his dual heritage. Whether harvesting rice, duck hunting, or making hay, the subjects of Gawboy's work carry the authenticity of an experienced lived. above Carrie Flaspohler, Director of the Finlandia University Gallery, introducing Carl Gawboy to the many art enthusiasts who came to view artist's work. "Transforming the Cutover" is on display at the Finlandia University Gallery through February 13. Read More and View Photos of Gawboy's great art. 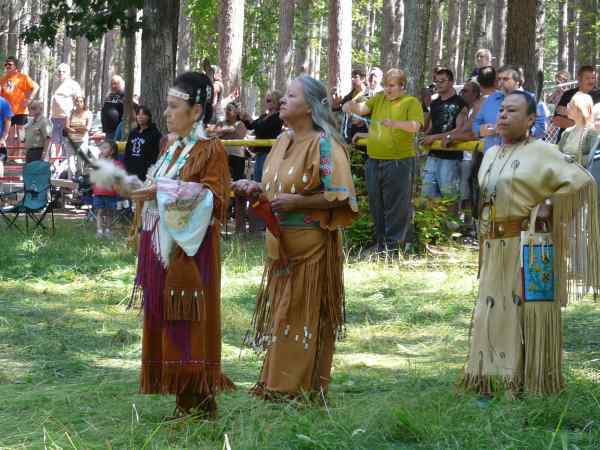 The Keewanaw Indian Community held its thirtieth annual pow-wow at the Ojibwa Campgrounds July 25th - July 27th 2008. Attending the pow-wow was great learning experience and something never forgotten. The Grand Entry is a parade entering the arena which is round, representing Mother Earth. The drum beat is the heart beat of the earth. After the Grand Entry there was an invocation followed by the Flag Song, posting of the Colors, and the Veteran's Song. The program then includes eight dances; Inter-Tribal Dancing, the Sneak-Up, Crow Hop, Exhibition Dancing, Men's Traditional Dancing, Woman's Traditional Dancing, Men's Fancy Feather, Woman's Fancy Shawl, Men's Grass Dance and The Woman's Jingle Dress. 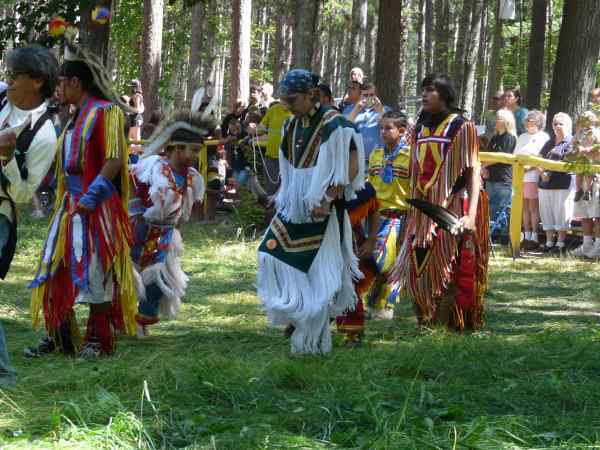 The pow-wow at Watersmeet came to a close Sunday after three exciting days of pow-wow. The Watersmeet powwow is somewhat smaller than the Baraga pow wow held a couple weeks ago, however it too has all the ingredients of a great event. There were many friendly attendees, vendors terrific drum groups and lots of tribal dancing. In fact, it was an entire day of dancing. It seemed as though there were a lot more children participating in this event. Lots of Dads and Moms walking their children around the arena. It was great to see young people learning about and living their heritage. The tribal website states "This event is a culmination of Native beliefs and traditions that inspire, communicate, and support Native American culture. It is with pride that we have expanded our facilities to support of our tribes growth and traditions.This event is a culmination of Native beliefs and traditions that inspire, communicate, and support Native American culture. It is with pride that we have expanded our facilties to support of our tribes growth and traditions."